Please see our Signature Woodturning Workshops (Deposit Only) category for more choices. 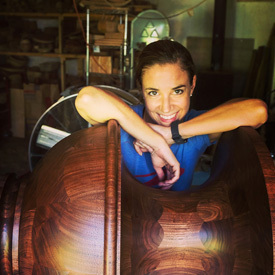 Ashley Harwood currently lives in Charleston, SC, where she creates her work and teaches at her personal studio. She has demonstrated in a number of professional venues throughout the US and abroad, as far away as Australia. Her teaching focuses on fine spindle turning and the Push Cut method of bowl turning along with the 40/40 grind on a bowl gouge. She received a BFA from Carnegie Mellon with a focus in sculpture and installation, and her design aesthetic is heavily influenced by her background in glass blowing. Ashley focuses on works that are completed entirely on the lathe, without carving, texturing, or burning. She uses simple, classic forms along with distinctive design elements that result in an approachable body of work with a high level of craftsmanship. Primarily, she makes utilitarian bowls, ornaments, and jewelry. Her teaching has a strong focus on tool control and sharpening. Find out more about Ashley by visiting her website: ashleyharwood.net, on Instagram @ashleygharwood , or on Facebook. The workshop deposit is non-refundable. We reserve the right to cancel workshops up to 6 weeks prior to the class date. Full tuition and deposit will be refunded for a cancelled workshop. Please do not make airline reservations prior to this time as we do not reimburse for any travel expenses incurred.